It is where all of the red granite that has ever been used in Egypt was obtained. Here, West points to a giant, unfinished obelisk that one can see off the tip of his walking stick, if one knows what he or she is looking for. It's the piece of rock with the square edge, sunlight glinting off the top, and all the people standing around it. The point of interest here is to notice how small the people are compared to the huge piece of rock they are looking at. Now we're up on the hill, where the people were in the previous image, looking down at the unfinished obelisk. 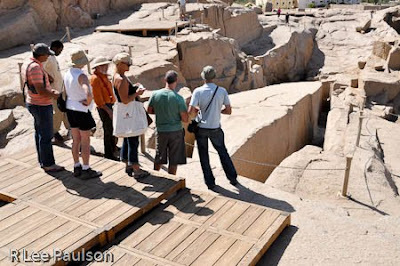 This huge, half excavated block weighs 1200 tons. 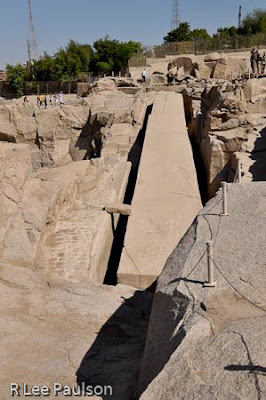 Look at this photo, then the one above and try to imagine how the ancients somehow managed to get these gigantic blocks down off that hill and onto barges floating in the Nile. That's no small feat for modern equipment, let alone the so called 'primitives' who supposedly had even less technology back then. Here are a couple of other shots of this behemoth. Notice how narrow the cut is on the left side of the block. That cut goes all the way to the bottom. Apparently, a rather nasty crack developed in this piece while they were excavating around it, which was lucky for us but unlucky for the ancient quarriers. It was unlucky for them because they had to abandon the project and start over. It was lucky for us because we now have absolute proof that the ancients did, in fact, get their red granite obelisks from this quarry. I believe the crack that caused the problem is the slight diagonal line that runs across the first horizontal mark from the top. Here's a close up of the slot cut on one of the sides. Notice in the shadow area the dents that look almost like pits, with ridges. 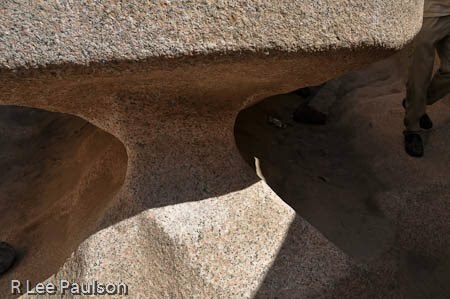 One wonders how the ancients without modern stone cutting tools with diamond blades managed to cut these edges so cleanly. Fortunately for us, someone who visited similar quarries in India came up with the answer, as similar methods are still employed there today. 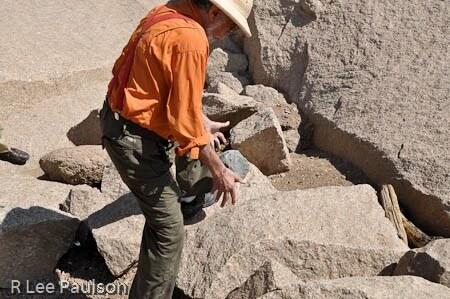 Granite is very hard, but there are other stones which are harder. Here, West is demonstrating the simplicity of the cutting technology. 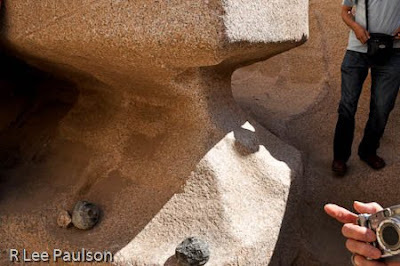 As I mentioned before, red granite like this is so hard that if one 'bounces' a harder stone against it, the harder stone will bounce back up, sort of like a basket ball. Here West demonstrates the idea. If you look between his hands, you will see a dark stone captured in mid air by my camera. That stone has just bounced up from where West threw it down against the granite below. That demonstration got West in all kinds of trouble with the tourist police. It happens every time he visits here with a group. Muhammad, our Egyptian guide, had to diffuse the situation with baksheesh. I, for one, appreciated the demonstration, however. Until I saw it with my own eyes, I wouldn't have thought the harder stone would have bounced that high with so little effort. It turns out that it is fairly easy for a practiced individual to set up a nice rhythm of bouncing the harder stone against the granite the way one would dribble a basket ball in place. Surprisingly enough, it doesn't take too awfully long before one has made a serious dent or hole in the granite. Here we are working our way through the side slots cut in another abandoned project. Notice the groves on the right, hard to see in the bright sunlight. But if one looks carefully, one can see how the groves become ridges on the bottom where Melony's feet are. 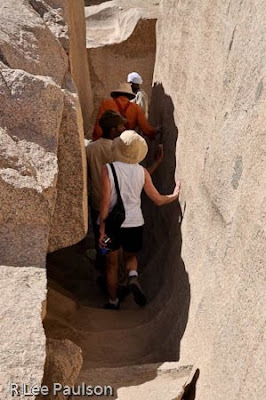 The distance between the ridges tells the size of the bouncing stones that were used to cut the granite. 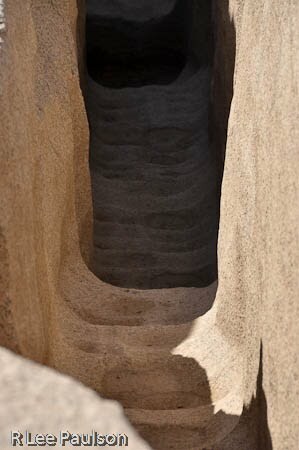 Here we see how the ancients cut the bottom out from under the huge stones. They somehow managed to bounce their stones sideways. I'm not clear how they did this. It seems impossible to me. But, it is hard to argue with proof that is staring one in the face. This piece was nearly cut all the way through before it was also abandoned for unknown reasons. 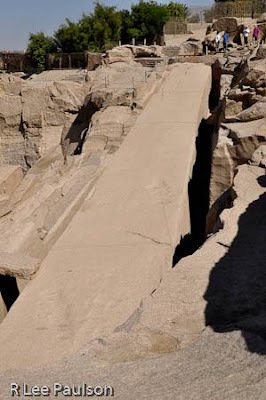 One suspects, that the ancients also had other forms of simple technology to move these huge blocks of stone. Because clearly what they did worked. The evidence can be seen in capitals all over the world, where folks have ripped off and shipped home obelisks such as these from Egypt. Each of those obelisks, at one time or another back in antiquity, was cut and moved out of this quarry. 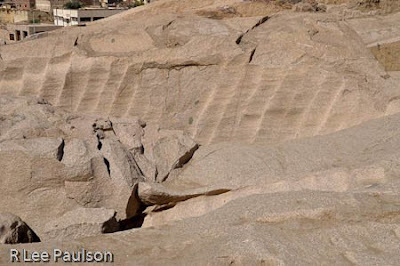 Here we get a better view of the marks made where a giant piece such as the two shown above has been removed from the quarry. Based upon the distances we see between ridges, it appears that the stones used to cut down that slope were fairly good sized. 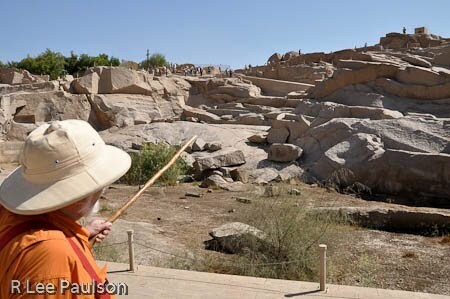 Next, we visit a little jewel, Philae Temple. Continue on to Post 35: Philae by clicking here.